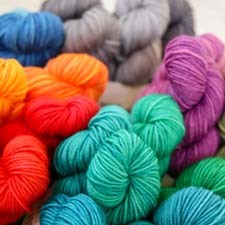 The April portion of our Anniversary Sale is winding down and these yarns will be back to full price on Sunday morning. Don’t miss your chance to snap up some incredible deals! I thought I’d share 3 of my favorite yarns from this part of the sale, and the projects I might be stashing them for (wink, wink). Cascade Eco Wool. When they were younger my kids used to call these my yarn babies, because they are absolutely huge skeins! 478 yds, of a bulky weight, gorgeously lofty Peruvian wool in the earthy, natural colors of the wool itself, this yarn is fantastic for warm and cozy sweaters and as a beautifully neutral backdrop for blankets. 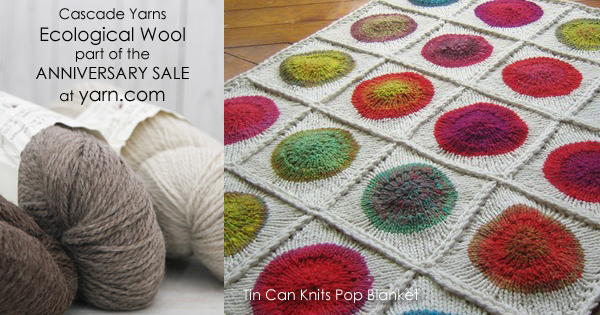 The Pop Blanket from Tin Can Knits is the perfect example. Shown here with Noro Kureyon as the bright center circles, this could easily be a scrap busting pattern with the Eco Wool gloriously framing those bits and bobs of yarn you just couldn’t let go of. Think of it as a memory quilt, here are little framed bits of yarns you loved to work with, and for projects like that the frame can be just as important! Classic Elite Alpaca Sox. I remember making a pair of socks as a store sample in this yarn when it first arrived. I did not want to give them back! The yarn felt amazing in my hands as it glided across my needles and the finished fabric was soft and cozy. 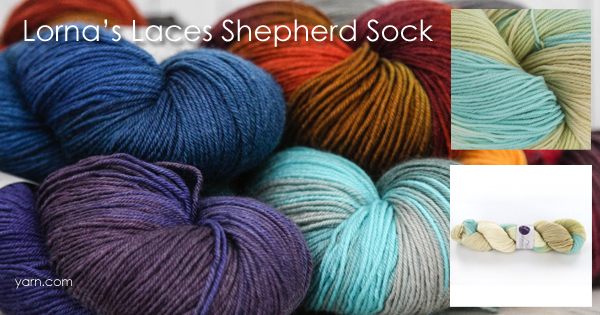 While it makes amazing socks this yarn also knits up into beautiful shawls and lightweight but warm accessories! The Wavelength Shawl features a center panel of stunning lace bordered by easy-peasy garter stitch, with a delicate lace border. This is a great project to cut your teeth on lace! The lace panel is isolated in the middle of the shawl giving your brain and hands lots of time to relax in the garter stitch sections. Noro Silk Garden Sock. 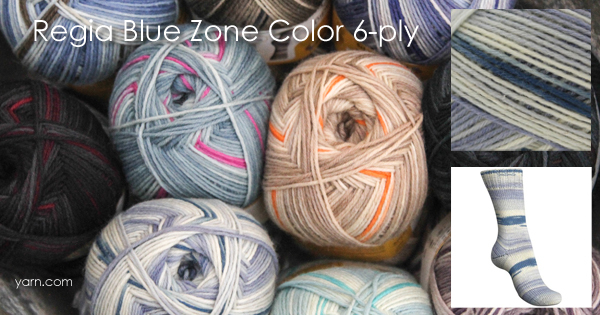 A perennial favorite, this yarn glows with all the amazing color changes that Noro has become famous for, and at the lighter sock weight it becomes the perfect choice for lightweight accessories with tons of color impact! For knitters the Mitered Wrap showcases those color changes in the meandering corners of a wrap that will result in oohs and aahs everywhere you go. 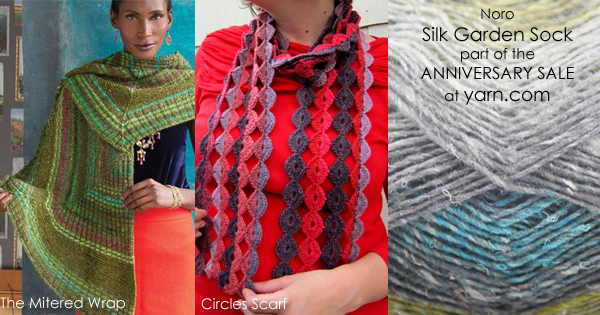 And crocheters can experience equal public curiosity and excitement with Linda Permann’s Circles Scarf. While this may look like a pile of tiny yo-yo’s that have been joined together after being made, Linda actually has a genius way of making these as you go along – only two ends to weave in! And don’t forget your tools! 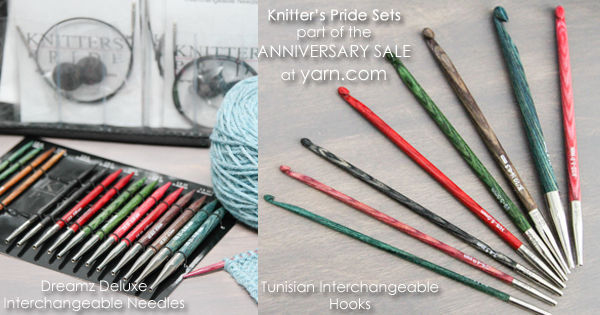 We have some pretty spectacular hooks and needles in the sale and you’ll want to grab a set. The Knitter’s Pride Dreamz line of needles and hooks feature a different color of laminated birchwood for each different size, making it easy to see which size is which at a glance! 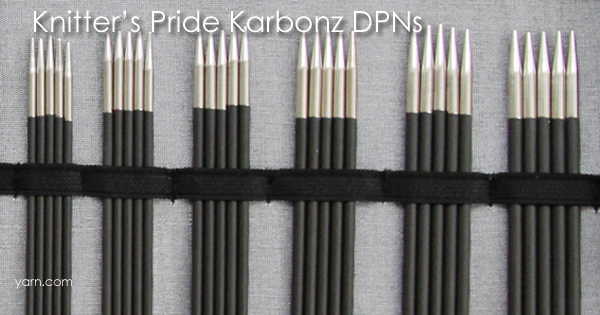 The Deluxe Interchangeable Needle Set includes 9 pairs of 4.5″ tips from US sizes= 4, 5 – 11, 4 cables (one 24″, two 32″, and one 40″), a case to hold your cables, 8 end caps, 4 cable keys, and a set of needle size ID tags, all organized in a clear vinyl case. And the Dreamz Interchangeable Tunisian Hook Set includes US sizes E – L, 4 cables (one 24″, two 32″, and one 40″), 8 end caps, 4 cable keys, a clear vinyl case and tunisian hook connectors to join two hooks together. What exciting deals will you take advantage of in the April portion of the Sale? Or have you already! 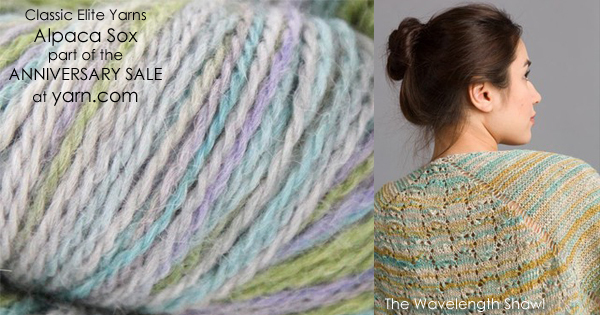 And don’t forget, a whole new selection of yarns goes on Sale May 1st!